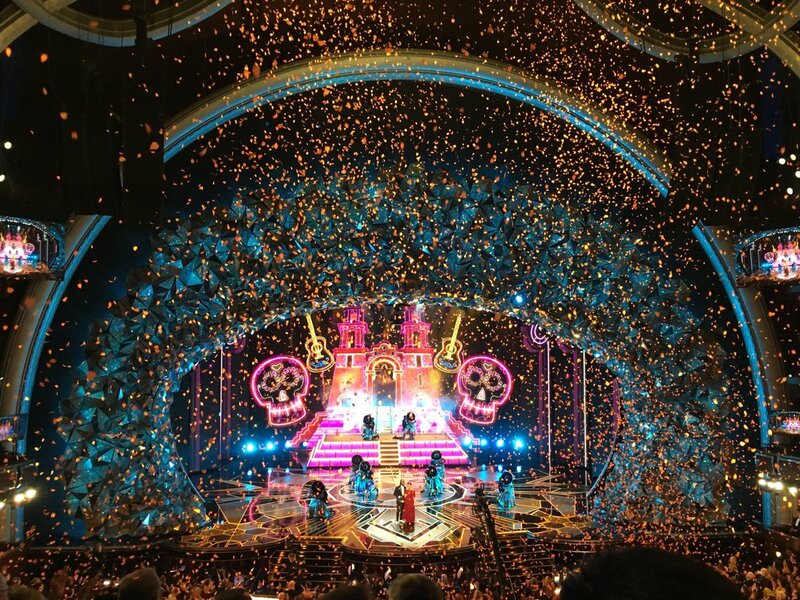 Though it might have been expected, Coco‘s victory at last night’s Academy Awards wasn’t any less sweet! And the film scored not one, not two, but three wins! First there was the sensational performance of “Remember Me,” beginning with Gael Garcia Bernal accompanied by a guitarist as he sang the gentle lullaby version of the song. It was impossible not to be moved, especially with Bernal’s spotlight on the darkened stage while thinking of that pivotal moment in the film when the lullaby is first heard. But a show stopping spectacle was waiting in the wings! Miguel and Natalia Lafourcade sized the stage with their rendition, complete with Ernesto de la Cruz’s legendary stage. It was reanimated just for Oscar night and mirrored the film closely! 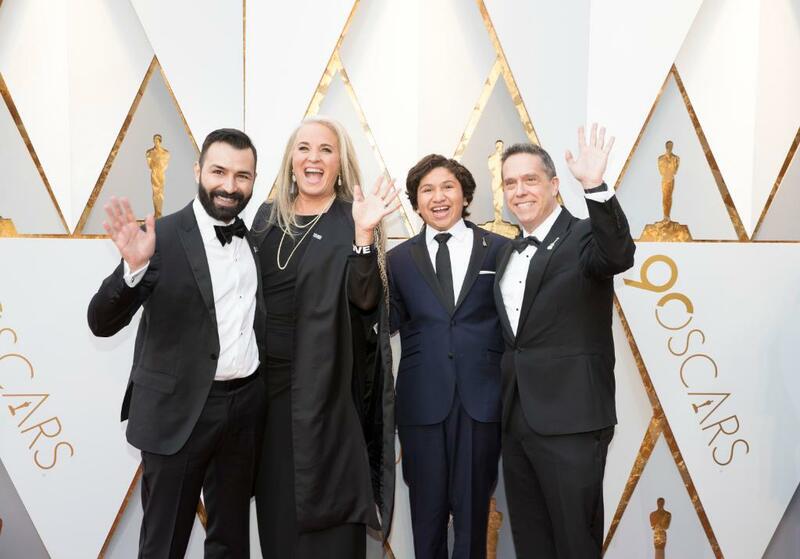 “Viva Latin America!” Oscar Isaac, one of the award presenters, cried out before announcing Coco the winner. It highlighted just how important this film is to so many and was the first indicator of Mexican filmmakers winning during the broadcast. Lee Unkrich and Adrian Molina were joined onstage by Darla K. Anderson and three in the film’s cast: Anthony Gonzalez (Miguel); Gael Garcia Bernal (Hector); and Benjamin Bratt (Ernesto de la Cruz). It was a first for Pixar filmmakers to be flanked by their cast at an awards show, and it’s particularly noteworthy since they’re of Mexican and Latino descent. Once more, it was impossible not to be moved as Lee, Adrian, and Darla gave their acceptance speeches. This was truly a momentous win for Coco. If you missed it last night or if you want to watch it again (and really, who wouldn’t? ), the segment appears below. Anthony Gonzalez also got a moment at the microphone, making Lee’s declaration that much more resounding. Coco‘s win in this category was unexpected, perhaps because it didn’t take home the Golden Globe back in January. “Remember Me” marks Pixar’s second ever win for Best Song (previously awarded to Randy Newman for Monsters, Inc.’s “If I Didn’t Have You”). Songwriters Bobby Lopez and Kristen Anderson-Lopez also secured their second Oscar win. There was no end to the inspiring speeches as Anderson-Lopez acknowledged the diversity of the nominees, while Lopez dedicated the award to his late mother. Although Dave Mullins’ short film “Lou” walked away empty handed, it was a spectacular night for Pixar and Coco. This film’s message of familial love, as well as its celebration of an underrepresented population, has been embedded into the cultural zeitgeist. It signals even more diverse and inclusive stories at Pixar and beyond. Representation matters enormously, and so does Coco. Congratulations to Lee, Adrian, Darla, the Lopezes, and the entire cast and crew for their tremendous movie and wins! Coco wins Best Animated Feature at the Golden Globes!